The “Interaction Design” course prepares designers to create new interactive objects, spaces, and services. The primary aim of the interaction design course is to equip students with the right skills in interaction design and set them off on a creative career path. New technologies have radically changed the rhythm of our daily lives. Far from being restricted to our smartphones and tablets, these technologies will be in our daily objects and services. Our environment will soon be populated with intelligent and communicating objects, offering services. It remains to define the way people will live and converse with these objects and services. The flooding of new technologies in our daily life has created a new field of exploration for the designer. New uses lead to new life scenarios and new behaviours. It is this new territory that we learn to discover in the “Interaction” department of our design programs. The Interaction Design course from Strate enables graduates to design core elements which make the world a faster, easier, and better place. The primary objective of the program is to give students the degree, training, experience, and tools they need to design more meaningful interactions between people and the products around them. At the end of the interaction design course, you will receive a BSc/MSc in Design from Jain (Deemed-to-be) University and an equivalent Master’s diploma “Mastere in Design” with RNCP credits from Strate School of Design, Paris. 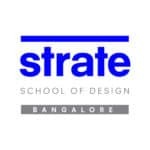 The minimum qualification required to apply for Strate’s Interaction Design course is a pass in Class 12 from any recognized university or board with an aggregate of at least 50%. There is no entrance exam for the interaction design course. However, there will be an interview with the school’s Dean, Thomas Dal, or a member of the faculty to assess your interest in the course. Know more about our design course admissions. Curriculum for the Interaction Design specialization. The first two years are common for all specializations. It is in the third year that you opt for your preferred course. Click on each year to see what the interaction design course involves. As a transversal discipline, interaction design covers many fields such as mobility, health, leisure, work, etc. Its ambition is to train tomorrow’s designers who will be able to imagine amazing, almost magical, usages of a technology that will be invisible. As one of the most comprehensive interaction design courses in Bangalore, our program includes all facets of UI/UX design along with many interdisciplinary subjects. The course encompasses IoT, programming, coding, storyboarding, 3D, HTML/CSS, etc. Along with regular classes, students will participate in numerous workshops, seminars, interactive sessions, and take up numerous internships throughout the course to gain ample experience in interaction design.